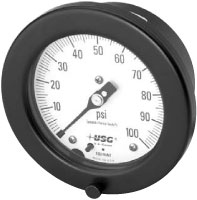 1903 and 1933 Series 6" Process Gauges Panel Mount gauges are designed to withstand corrosive atmospheres and media pulsation and vibration. A very rugged gauge engineered for the process industries. The solid front provides a high degree of user safety.